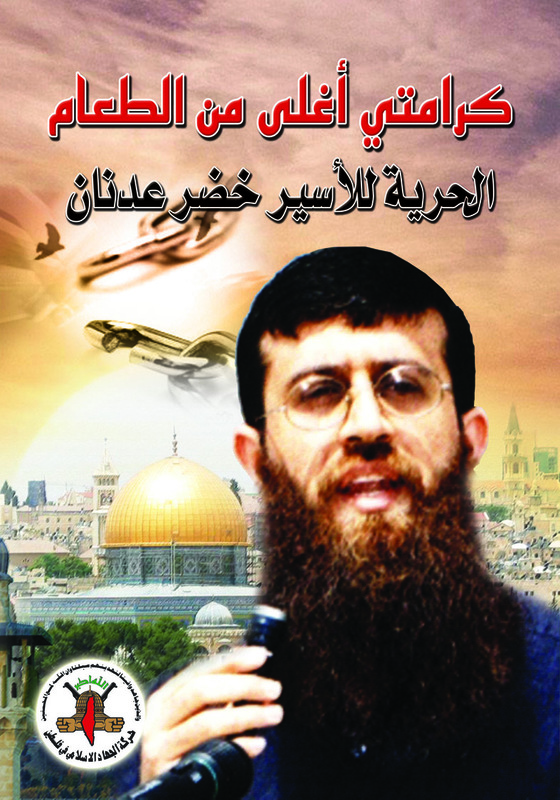 Khader Adnan's photo under this slogan "My dignity is more precious than food"
If you have the power, you can abuse it and no one will say a word in protest. At least this is the case for Israel, which openly violates international law and human rights feeling secure that one will stop it. But Khader Adnan, a detainee from Jenin, has decided not to stay silent and accept injustices against him and his fellow prisoners. He is battling armed jailers with his only weapon: his empty stomach. Khader started hunger striking the day of his arrest, December 18, to protest the unjust administrative detention he is serving and the indescribable cruelty he has experienced since then. It’s worth mentioning that administrative detention is a procedure the Israeli military uses to hold detainees indefinitely on secret evidence without charging them or allowing them to stand trial. Over 300 Palestinian political prisoners are serving this term now, and tens of thousands of Palestinians have experienced administrative detention since 1967. My father served this term three times. Previously, he had been sentenced to seven lifetimes plus ten years, but released in the 1985 prisoner exchange after serving thirteen. As I read about Khader’s story in a report by Addameer Prisoner Support and Human Rights Association, stories about Dad’s experiences in Israeli prisons came back to me. The last time it happened, a month after I was born in 1991, was the hardest. My mother told me how I came into this life where safety, peace, and justice are not guaranteed. ”In the middle of the night, a huge force of armed Israeli soldiers suddenly broke into our home, damaging everything before them. They attacked your father, bound him with chains, and dragged him to the prison, beating him the whole way.” The happiness of a new baby – me – didn’t continue for the whole family. My traumatized mother was able to breastfeed me for a month, but then she couldn’t anymore; her sorrow ended her lactation. Every Palestinian is convicted to a life of uncertainty without having to commit a crime. Being a Palestinian is our only offense. For Khader, this detention is not his first time in Israeli prisons. It’s actually his eighth, for a total of six years of imprisonment, all under administrative detention. Each one had a different taste, ranging from bitter to bitterer. This time, the Israeli Occupation Forces (IOF) raided Khader’s house at 3:00 am using a human shield, Mohammad Mustafa. Mohammad is a taxi driver who always takes Khader’s father to the vegetable market. He was kidnapped by the IOF and forced to knock on Khader’s door while blindfolded. Then the IOF raided Khader’s house, trashing it as they did. Shouting, they aggressively grabbed his father, with no consideration for Khader’s two little daughters, his wife, who could have miscarried her five-month fetus, or his sick mother. But when did IOF have any respect for human values? Khader was immediately blindfolded, and his hands were tied behind his back with plastic shackles. Afterwards, the soldiers pushed him into a military jeep with non-stop physical torment that continued for the ten-minute drive it took for the jeep to reach Dutan settlement. You can imagine how a short period seemed like forever to Khader, who was unable to move or see while every part of his body was continuously and brutally beaten. To make things even worse, Khader’s face was injured when he smashed in a wall he couldn’t see due to the blindfold wrapping his eyes after he was pushed out of the jeep. Addamear reported that after Khader’s arrest, he was transferred to different interrogation centers and ended up in Al-jalameh. Upon arriving there, Khader was given a medical exam, where he informed prison doctors of his injuries and told them that he suffered from a gastric illness and disc problems in his back. However, instead of being treated, he was taken to interrogation immediately. The interrogation period, which lasted for ten days, took the form of psychological torture with continuous humiliation using very abusive language about his wife, sister, children, and mother. Throughout the interrogation sessions, his hands were tied behind him on a crooked chair, causing extreme pain to his back. Believing in the power of silence, Khader’s only response was to object to the interrogator’s use of increasingly insulting speech. Because of Khader’s hunger strike against violations of his rights and the terrible treatment used against him, Addameer reported that he was sentenced to a week in isolation by the Israeli Prison Service (IPS) on the fourth day of interrogation. Moreover, in order to further punish him without being required to go to court, the IPS also banned him from family visits for three months. In addition, during the second week of interrogation, Khader experienced further humiliations. One interrogator pulled his beard so hard that it ripped hair out. The same interrogator also took dirt from the bottom of his shoe and rubbed it on Khader’s mustache. But they couldn’t break his dignity, and even after the interrogation ended, Khader continued his hunger strike. According to Addameer report, on the evening of Friday, 30 December 2011, Khader was transferred to Ramleh prison hospital because of his health deteriorating from the hunger strike. But even there, he lacked medical care. He was placed in isolation in the hospital, where he was subject to cold conditions and cockroaches filled his cell. He refused any medical examinations after 25 December, which was one week after he stopped eating and speaking. The prison director came to speak to Khader, or rather threaten him, commenting that they would “break him” eventually. I know I mentioned before that there are no trials for Palestinian detainees under administrative detention. But actually, they do get a trial. It’s not for them to challenge the reasons for their detention though. It’s for a military judge to decide the period they are going to serve according to the “secret evidence” that IPS holds against him, none of it shared with the detainee or his lawyer. This is an obvious violation of human rights, leaving Khader and detainees like him with no legitimate means to defend themselves. On 8 January 2012, at Ofer military court, Khader received a four- month administrative detention order. There, he was threatened by members of the Nahshon, a special intervention unit of the IPS known for particularly brutality in their treatment of prisoners, who told Khader that his head should be exploded. Khader’s health is deteriorating rapidly. He is refusing treatment until he is released, but a prison doctor has threatened to force-feed him if he continues. Cameras in his cell watch him at all times, and if he does not move at night, soldiers knock loudly on his door. This prisoner is at risk, so SUPPORT Addamear campaign to call for his release. People in Gaza set up a tent in front of the Red Cross last Thursday to join Khader’s protest against his administrative detention and violations of Palestinian detainees’ simplest rights, and demand justice and freedom for them. Something must be done against this unjust system and its conditions of imprisonment. International solidarity is greatly needed. Join Addameer’s campaign to Stop Administrative Detention. ACT NOW! This entry was posted on January 22, 2012 by Shahd Abusalama. It was filed under Palestinian Political Prisoners, Stories from my father's life and was tagged with Gaza, Hunger Strike, IOF, Ismael Abusalama, Israel, Khader Adnan, Palestine, Palestinian Political Prisoners, Palestinian prisoners.